One of my readers, DJ, passed on a link to the Dwellbox project which is currently under construction in Boone, North Carolina. It’s a small house built from ISBU’s (Intermodal Steel Building Units) which simply seems to be a fancy way of saying old shipping container. This little house uses four short cargo containers stacked and welded together. Progress seems to be happening very quickly. They have setup a simple blog at dwellbox.com and seem to be posting regularly. The team is an experienced and diverse group of people who seem to be focused on showing the viability of this green building technique. This is definitely a project to keep our eyes on. Leslie, another reader passed on this link to a good overview article building with cargo containers at uship.com. Kent at TinyHouseBlog.com has also written several posts on shipping container houses. 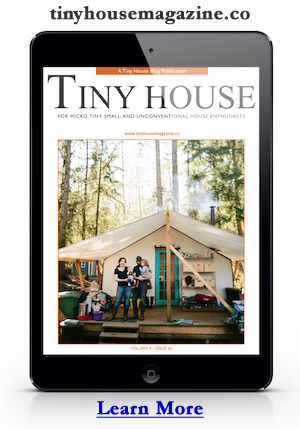 There is also more information right here on TinyHouseDesign.com on the same topic. I personally prefer building with wood but I must admit the idea of a reused steel container is appealing. I’m certain in extreme weather conditions and earthquakes a steel building would be a much safer place to be than a stick build house. Photo credit Dwellbox.com. This entry was posted in Tiny House Projects and tagged cargo containers, dwell box, dwellbox, Intermodal Steel Building Units, ISBU, shipping containers. I liked that they used a roof with some pitch to it, which makes the house seem more like a home to my eye. Most of the other shipping container homes I’ve seen keep the flat top. This is so nicely done that when it is finished and painted, it might be hard to tell it’s metal until you are very close. In the second photo, where the building is dappled with shade and sun, can you tell it’s stacked shipping containers? I couldn’t from the pix. This will be interesting to watch as it progresses. Check out the Tandemloc site for drawings, fittings, and ideas. Sea Box in Riverton, NJ does lots of commercial and military conversions and their site has many pics. Lord Fusor automobile structural adhesives are alternatives to conventional welding and sealing. No, I don’t work for them, I just like containers. A 20-footer can be delivered on a rollback car carrier, and a 40-foot (get the 9’6″ tall High Cube for extra headroom, you have been warned!) can be delivered and set using a Landoll trailer. I camo’ed mine, since no structure looks “better” than woods and it makes them unobtrusive. Paint the roof silver to drop temps. Tools to work them include a Sawzall, 6 or 7 inch angle grinder (NOT larger or smaller, you’ll see why, and use Pferd cutting disks! ), and a small MIG welder. Why can’t these be built in Haiti with the $400 million dollars that the Red Cross collected? Does ‘admininistration’ need to keep all $? What are they waiting for? Did anyone think of permits and building inspectors. They have attitudes with regular size buildings. Building inspectors come in all types, some are great to work with, others tough to please. But my guess is that all of them are simply following local rules. The real work that needs to be made is with the community and local policy makers.